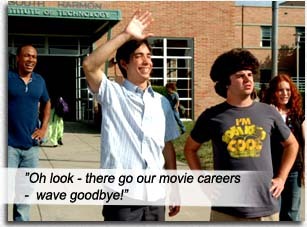 In the tiresome ACCEPTED, Justin Long is Bartleby Gaines, rejected from a series of reputable colleges. To appease his parents, he forges an acceptance letter to a fake college, and then finds he must create an actual campus to follow through with his ruse. So is born the South Harmon Institute of Technology (the sophomoric acronym S.H.I.T. used with ubiquitous abandon and little effect). through the methodology of Inspiring Movie Speeches Accompanied by Music Swells (be still my SCENT OF A WOMAN). Writers Adam Cooper, Bill Collage and Mark Perez, and director Steve Pink ask us to accept too much without so much as a giggle in return. Photoshopping letters of acceptance is one thing; designing a website that would pass scrutiny for parents about to shell out $10,000 for semester fees is quite the stretch. Then come bleating at us the uncountable clichés: the tomboy chick friend, the fat friend, the black friend, the stupid friend, the geek friend, the hot chicks, the jock fraternity trying to bring down the fake geek university (and being regarded as the Bad Guys for doing so – even though the geek university is a scam), Bartleby’s smart-aleck twelve-year-old sister, who can see through his ruse even though his parents can’t (she says of South Harmon, “I haven’t heard of it” – maybe because you’re twelve, snot!). At nearby Harmon College, the movie continues the grand American tradition of disparaging “real” education: students struggling to keep their eyes open, playing video games, or unknowingly turning into corporate monkeys due to being educated the “conventional” way. In other words – there is NO WAY for an American Idiot to be educated. This is the message of ACCEPTED. And we wonder why the rest of the world laughs at America. The movie espouses some valid points, but since the resident Madman (Lewis Black) makes these points, they are lunatic ravings. The education system in America IS an Agrarian Age system, more interested in leaching the inquisitive mind of the desire for knowledge and pimping students unto society as peons for the workforce than it is in “educating” individuals. But the dropouts and losers who populate the fake South Harmon college are not there for real “education” either. They are goofing off in lieu of learning and seeking diplomas for it. Like those commercials advertising you don’t have to break a sweat to get great abs with their lazy machine – but if you don’t break a sweat, you’ll NEVER have great abs, with or without their useless machine. Arguing that leaving the dropouts to their devices will produce the scientists and scholars of tomorrow is demonstrably asinine. But enough impassioned movie speechifying and inspirational music and you can achieve anything, kids! Writers: Adam Cooper, Bill Collage, Mark Perez. Starring: Justin Long, Jonah Hill, Adam Herschman, Columbus Short, Maria Thayer, Lewis Black, Blake Lively, Mark Derwin, Ann Cusack, Hannah Marks, Robin Taylor, Diora Baird, Anthony Heald, Travis Van Winkle.